Most of time, we'd like to have barbecue at night, but there are always moments when food fails to be cooked well in the dark. See everything clearly on the grill with the MARNUR Barbecue Grill Light, which makes your barbecue experience more enjoyable, biding farewell to dark night barbecue. Do you like have a outdoor party at night? 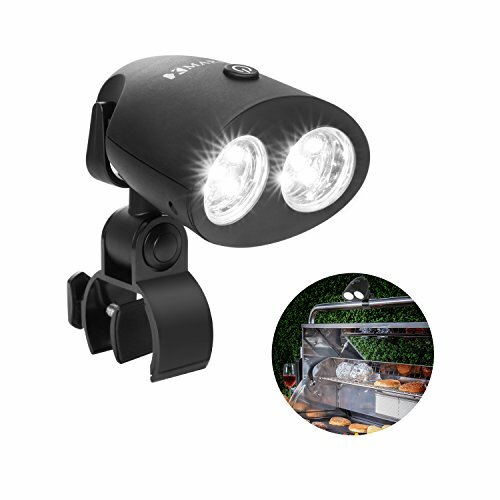 MARNUR led grill light could gives you a colorful night, the electric light are suitable for household or outdoor use - camping, hiking, biking, reading, and so on. ▶The grill light is powered by 3 AA batteries (not included in the purchase). ▶A small screwdriver, a storage pouch, and a piece of wiping cloth are included. ▶2 brightness levels are available. ▶Resists heat up to 180℃. ▶Adjustable screw clamp makes it very easy to install (no tools required) on the grill handle. ☉The grill light resists intense heat, but please keep a safety distance between it and fire. ☉Please do not immerse the grill light in water. ☉If the grill light is not to be used for long, please remove the batteries.